When working at height it is important for the user to be both confident and comfortable in their equipment. SpanSet's harnesses have been designed, taking into account the demands of the different types of work and the environments in which they are used. For most Fall Protection applications the rear attachment on the harness is used. On some occasions it may be necessary to attach to the front as with connection to a permanent ladder system or to undertake a rescue. The following Harnesses have such attachments in differing designs. 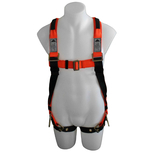 This harness is similar to the US1120 but offers the benefit of tongue and buckle leg straps. This harness is manufactured to ensure comfort, safety, and practicality. The breathable mesh panel gives the harness form and simplifies donning and minimizes tangling. Features SpanSet redundancy backup design and robust construction.